Some care homes have commissioned Maes to create artwork on doors and other surfaces, making them esthetically pleasing but also less interesting for wandering residents. This undersea scene, filled with vibrant animals and plants, is among the colourful creations of mural maker Rachel Maes. Next time the word mural pops to mind, think Rachel Maes. Maes is the very much in-demand Winnipeg artist who comes to your home or business — just about anywhere, actually — and hand-paints the mural of your choosing on any wall you like. She also does fences, furniture — basically, anywhere there’s room to paint a mural or decorative work, Maes will design and create pretty much whatever your happy heart desires. Her fave? She loves painting murals on kids’ bedroom walls. Oh, she does so much more, but before I get into detail about the eye candy she’s bringing to local homes and businesses, let’s talk about the "functional art" aspect of her biz, functional art being both beautiful and useful. Currently, in care homes in and around the ‘Peg, her murals and artwork are being used to help distract people with dementia from everyday realities that may present a hazard to them. Example: doors. Confusion can lead a dementia patient and those with similar conditions to perhaps mistakenly open a door they shouldn’t, allowing them to accidentally put themselves in harm’s way. 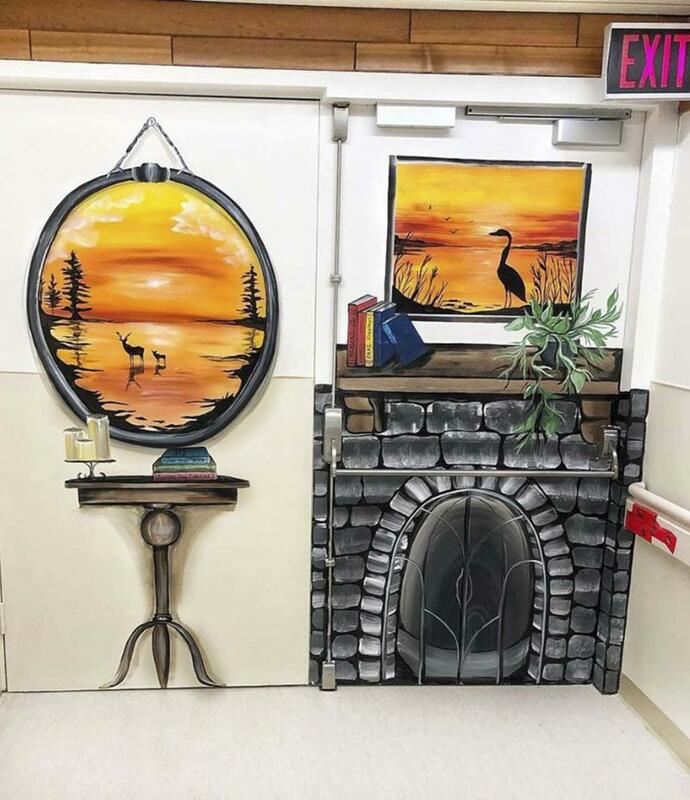 Care facilities hire Maes to paint, for instance, a mural of a bookshelf covering the door, so patients perceive it as something different, drawing their attention away from a situation that might otherwise put them at risk. My mother, Ramona Mustard, lived with dementia for the final few years of her life, and the less opportunity she had for confusion to compromise her safety, the better. Sounds like an excellent idea to me. OK, let’s check out some of the projects local folks have commissioned her to create in and around their residences. One happy customer, missing a favourite Manitoba destination, had her recreate Tulabi Falls on their exterior garage wall, so it’s there to admire year-round and through all seasons. Got a favourite vehicle you just can’t get enough of? No problem. Maes, just as she did for another customer, will paint a big beautiful mural of it on the exterior of your garage door! Nice to have your Jeep welcome you every time you pull into your driveway. There are numerous requests for nature-related murals — sunsets, clouds, a beach, perhaps... name your passion, and she will paint it, wherever you want it. Ceilings are popular for sky scenes, also for gazing out into the universe, which by the way, she sometimes does in glow paint, bringing the universe directly into your bedroom, living room or washroom — wherever you’d like to do a little stargazing. Adding a black light can really enhance the effect, but glow paint works on its own as well. For those not presently living in their "forever home," an apartment maybe, who would still like a mural to adorn their living space, she sometimes paints on masonite sheets, or other suitable materials, so when the occupant leaves, the mural can go with them! Everybody wins! Along with those increasingly popular murals, Maes also works her creative magic on pretty much whatever you’d like a personalized painting on — canvas, ornaments, the possibilities are endless, which is why, understandably, she is one busy artist. Availability? A project (mural) booked today will be yours within a two-month window, and once undertaken, is always completed within two days. Did I mention she also does pet portraits? Indeed she does. All this, and self-taught too! Children’s hospital rooms seem like the perfect place for her murals. What kid (or adult) wouldn’t feel better facing a whole wall of golden retriever puppies, kittens or dolphins? For me? Any and all animals, of course, and any summer gravel road that leads to adventure. Have questions for Rachel Maes? Simply do a Google search for Rachel Maes Creative Reign, and there she is. Comments or feedback, love to hear from you at lmustard1948@gmail.com.